Epifanio Pena was one of eleven children born to Jesus Pena and Guadalupe Castaneda in southeastern Coahuila. 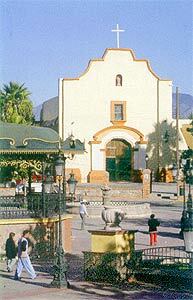 He was baptized April 20, 1871 in San Nicholas Tolentino, in the city of Ramon Arizpe, Coahuila. He married Petra Garcia in 1898, probably in a civil ceremony. She was born October 19, 1883 in Mexico, the daughter of Gregorio Garcia and Josefa Romero (a). The first child of Epifanio and Petra, son Juan, was born in Mexico in 1899, probably shortly before they immigrated to the United States. 1. Son Juan Peña was born in Mexico in 1899. He was living with his parents in the Boquillas-San Vicente area in 1900 and 1910, but no additional information is available on him. A. Son Higinio Peña, Jr. was living in Alpine in November 1969. B. Daughter Mrs. Sylvestre Silvas (a) was living in Sanderson in November 1969. C. Daughter Mrs. Ramona Olivares (a) was living in Sanderson in November 1969. D. Daughter Mrs. David Hernandez, Jr. (a) was living in Casa Grande, Arizona in November 1969. 3. Daughter Paula Peña was born January 25, 1902 in Texas. She was baptized May 30, 1903 in San Vicente by Father Brocardus. Her godparents were Domingo Ontiveras and Leandra Picaso. She probably moved to Sanderson with the family in 1918 and was a resident there until her death in 1955. She died in Fort Stockton Memorial Hospital of Uremia February 26, 1955 and is buried in the Sanderson (not Santa Rita) Cemetery. Her married name was Perez. 4. Son Faustino Peña was born February 15, 1903 in Texas. He was baptized May 28, 1905 in San Vicente by Father Brocardus. His godparents were Miguel Flores and Gomecinda Hinojos. He probably moved to Sanderson with the family in 1918 and died there April 26, 1958. He is buried in Santa Rita Cemetery. A. Son Salvador Peña was born in Jeff Davis County August 15, 1935. 6. Son Felipe Peña was born May 1, 1905 in Texas and was baptized May 28, 1905 in San Vicente by Father Brocardus. His godparents were Miguel Flores and Gomecinda Hinojos. He was living with his parents in the Boquillas-San Vicente area in 1910 but not additional information is available on him. 7. Son Clemente Peña was born November 23, 1907 in Brewster County and was baptized April 26, 1908 in San Vicente by Father Brocardus. His godparents were Epifanio Salas and Juliana Leyva. From 1961 to 1972 he was a resident of Andrews, Texas where he worked as a ranch hand. He died of congestive heart failure in Andrews Hospital on May 6, 1972 and is buried in the Andrews Cemetery. His wife’s name was Trine. 8. Daughter Nolberta Peña was born January 4, 1908 in Texas. She was baptized October 2, 1910 in San Vicente by Father Brocardus. Her godparents were Bernardino Gamboa and Gomecinda Hinojos. No additional information is available on her. 9. Carlos Peña was born November 4, 1909 in Boquillas (b), Texas. He was baptized October 2, 1910 in San Vicente by Father Brocardus. His godparents were Eustolio Rivera and Adelaida Gamboa. He moved to Sanderson with the family in 1918 and worked on various ranches in the area until 1938. He then went to work as a laborer on the Southern Pacific Railroad until 1960, when he retired because of poor health. He spent the last 15 months of his life in William Beaumont General Hospital in El Paso, where he died of Multiple Myeloma June 10, 1963. He is buried in Santa Rita Cemetery. Carlos married Genoveva Rodriguez May 28, 1929 in Sanderson and they had seven children. In June 1963 all were living in Sanderson except Acencion, who was living in El Paso. A. Son Juan Jose “Johnny” Peña was living in San Angelo in January 2003. 11. Son Jose Garcia Peña was born March 18, 1918 in Texas. He was a resident of Sanderson where he worked as a ranch laborer. He died August 18, 1963 in an automobile accident on US Route 90 about 8 miles west of Sanderson. He is buried in Santa Rita Cemetery. 12. Daughter Eulalia Peña was living in Sanderson in November 1969. Her married name was Rios. (a) Her mother’s name is shown as Manuela in Petra’s marriage record and Josefa in her death record. (b) Names as shown in their father’s obituary. · Terrell County web site list of graves in Santa Rita and Sanderson Cemeteries. · Marriage and baptism records from San Nicholás Tolentino, Ramos Arizpe, Coahuila, accessed via the FamilySearch web site. · Baptism Records from Sagrario Metropolitano, Saltillo, Coahuila, accessed via the FamilySearch web site.